Living in NYC requires serious antioxidant protection. Fortunately, I just discovered a tea bar near Union Square that offers healthy tea that actually tastes good. I'm not a big fan of the green tea taste, but I still force down my daily cup. 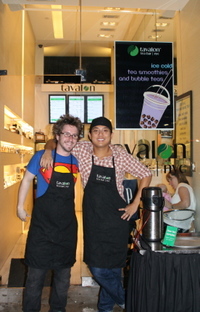 As I was walking by Tavalon, there were free chilled tea samples being handed out. Of course, I grabbed one and discovered the perfect tea for me: White Tea with Peppermint sweetened with Korean Plums.I love it for its slightly tart taste with just a hint of sweetness. Best of all, white tea actually tastes good so I can finally enjoy tea rather than treating it like medicine! In fact, white tea offers greater health benefits than green tea as noted by NBC news: "...studies have indicated that white tea offers even more cancer-fighting antioxidant agents than green tea." The fun of Tavalon is that there are so many cool (and healthy) things on the menu that I can't wait to try (even if they just sound cool) such as: Detox, Green Tea Latte, Herbal Fruit Freeze, Pom Black, MoTEAjo, Honey Nut Latte, Brazilian Hot Chocolate, Acai Smoothie, Antioxidant Shot, and even Tea Cookies. There is also a great variety of packaged tea so that one can experiment with his or her creative tea mastery at home. I also love the chill vibe of the place; it has that small neighborhood bar feel to it where you just want to hang out, sip tea and chat. Chris and PJ are such fun to talk to...I'll be back for sure.